A DISASTER OCCURRED before the walk even started when Neil reported too sick to walk. 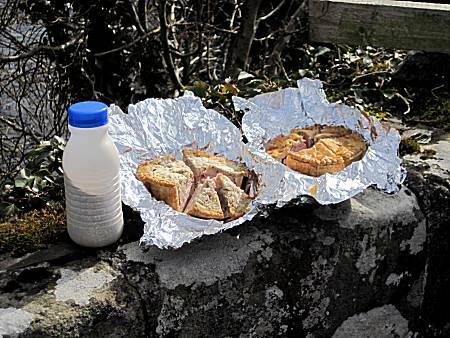 Therefore in the morning just 4 subdued walkers arrived at the long stay car park in Pateley Bridge, but their spirits were soon lifted when Ron produced a quantity of excellent bacon and sausage sandwiches. 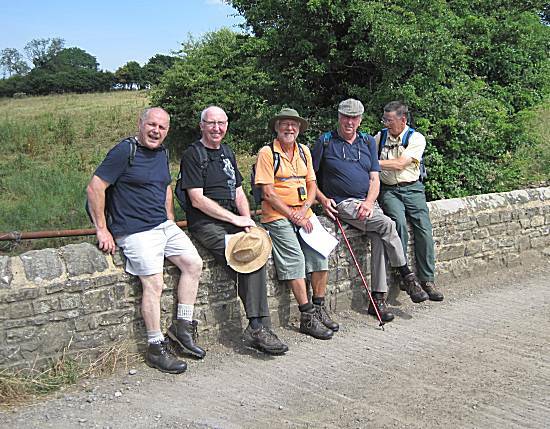 Knowing also that Colin had also brought a game pie and Alan had sufficient mars bar crispies, they set off quickly along the familiar route out of the town following the river. 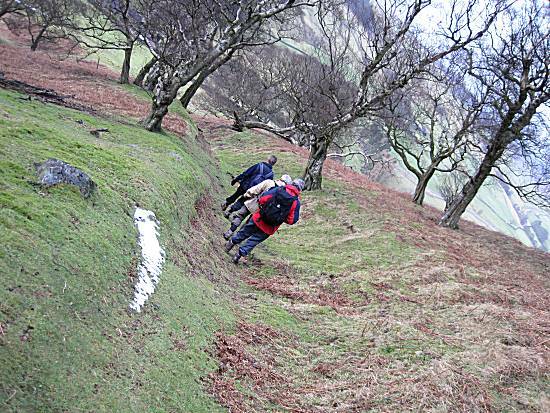 Proficiently they reached the end of Gouthwaite Reservoir taking the steep path upwards, refusing to stop for refreshments, where they took the long climbing pathway towards the shooting lodge. 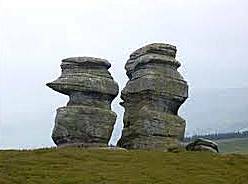 Ron was quick to show the walkers the famous rocks "Jenny Twigg and her daughter Tib". 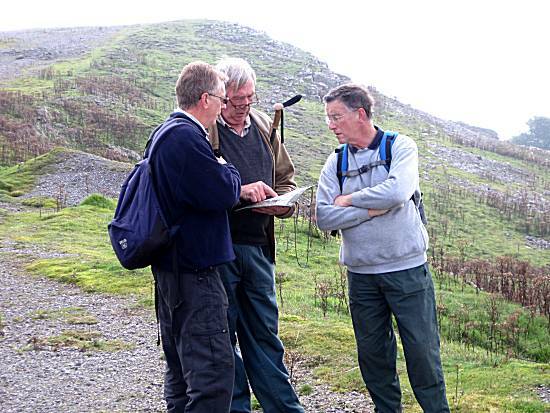 The walkers were fascinated as Ron related the tales of Folk Lore relating to the rocks. 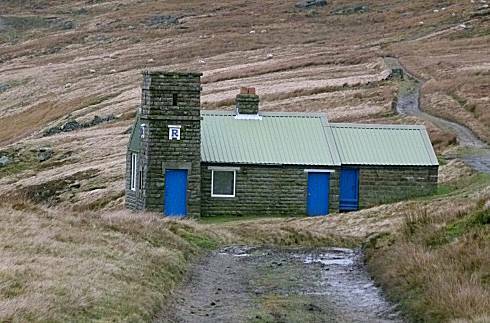 Soon the walking lodge came into view and the walkers were pleased find that the owners had left the rear room open for them to consume their game pie and some mars bar crispies. Much refreshed the walkers started the dangerous decent into the deep dale below. 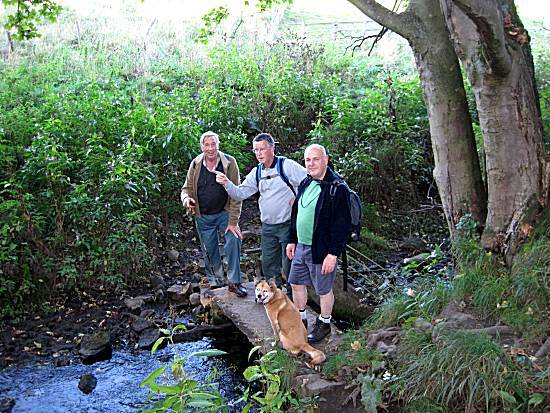 The walkers found the decent slippery and dangerous with Ron falling, until they mastered walking at an angle which proved very successful. 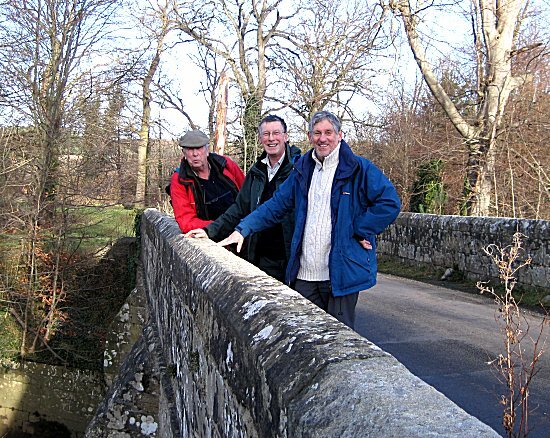 Ron could not believe their incredible performance as they looked back up towards the shooting lodge from the relative safety of the roadway below. 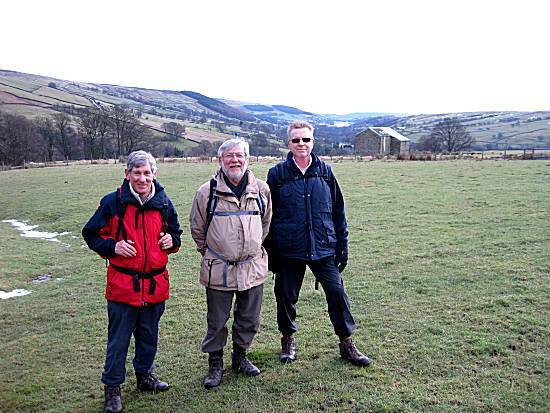 After lunch the walkers set off on the 7mile journey back passing Gouthwaite Reservoir, which can be seen in the distance. 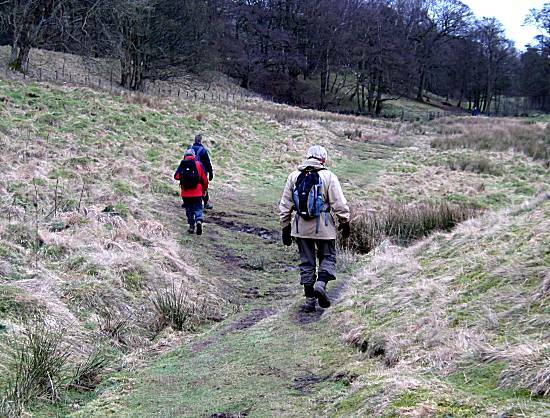 The walkers were seen posing for pictures and walking though the impossible conditions heading back towards Pateley Bridge. 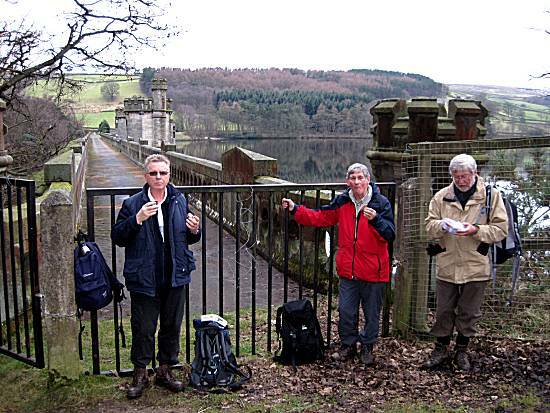 The walkers reached the dam of Gouthwaite Reservoir and quickly stopped to consume the last of their mars bar crispie rations (except Andy). Reaching this point indicated to the walkers the almost certain success of their long walk. 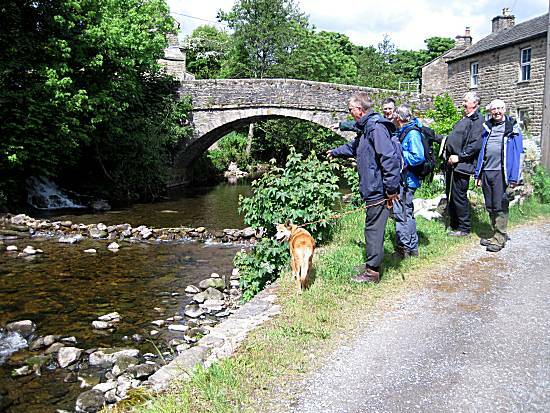 With the extra sustenance the walkers soon reached the safety of Pateley Bridge and the walkers agreed that this had been successful and enjoyable walk, despite being somewhat longer than recent walks. They departed to their homes in a good mood. 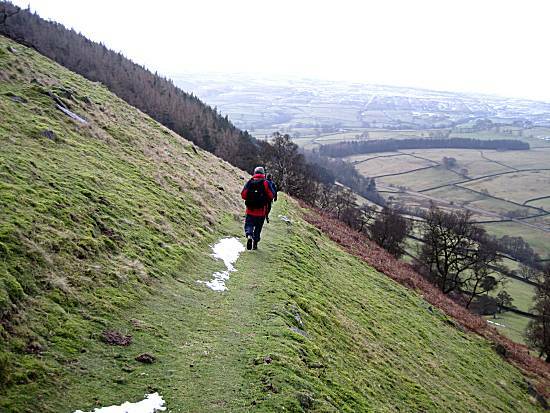 Weather: Damp and Muddy, with a little fresh snow underfoot. A good walking day. 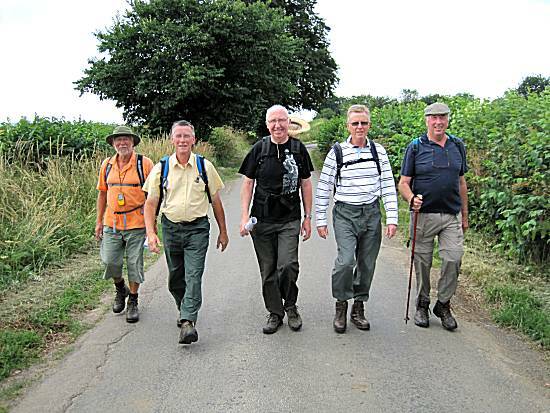 Walkers: Andy, Colin, Ron and Alan. Distance: Not too long !!! 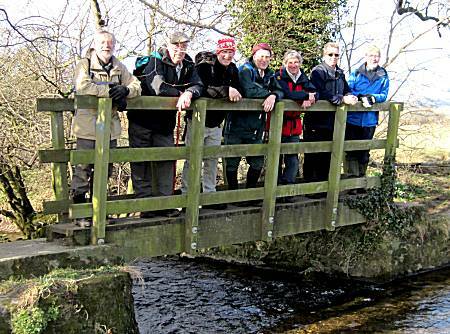 Eight walkers arrived in the car park of the Coverbridge Inn at the beginning of a walk in remembrance of their fellow walker Neil, who sadly died on the 9th March of pneumonia. 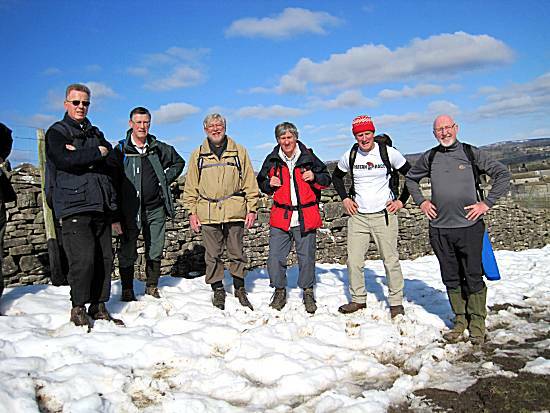 Alan brought some of Neil's ashes, in a suitable milk bottle, which gave the walkers much comfort. 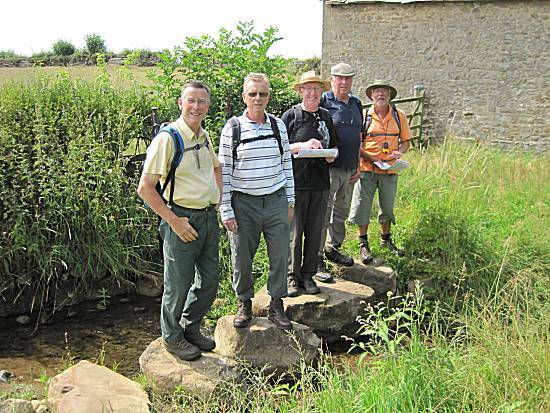 After devouring Ron's excellent sausage and bacon sandwiches, they set off to follow the River Ure. 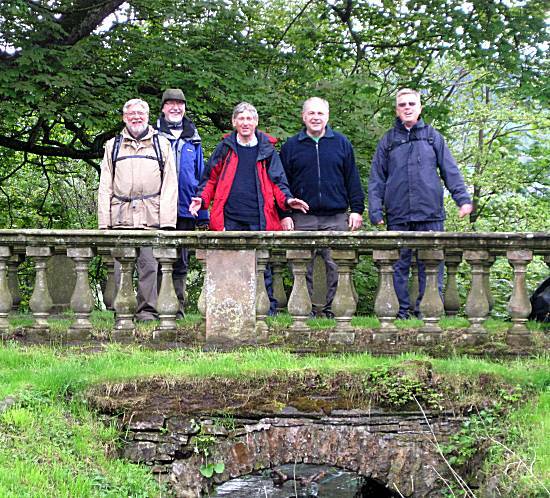 The walkers tested the strength of the first bridge they came across, by posing for a group photograph. 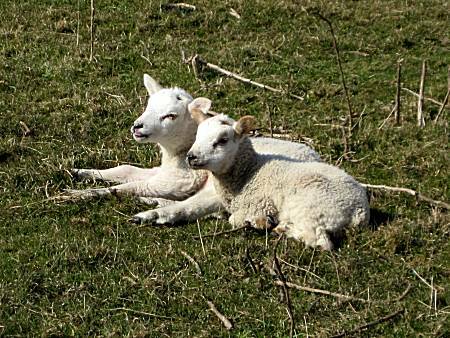 Many newly born lambs waited patiently to pay their respects to Neil as the walkers passed by. Before long the magnificent Middleham bridge came into view and the walkers hurried to use it to get to the other side, where they took a turning into a road continuing to follow the river. 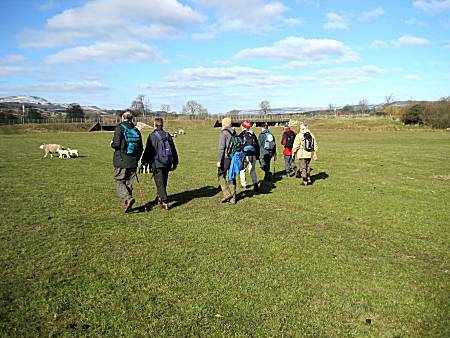 The walkers continued their walk through fields of sheep with many more new lambs, stopping only for a few mars bars crispies. 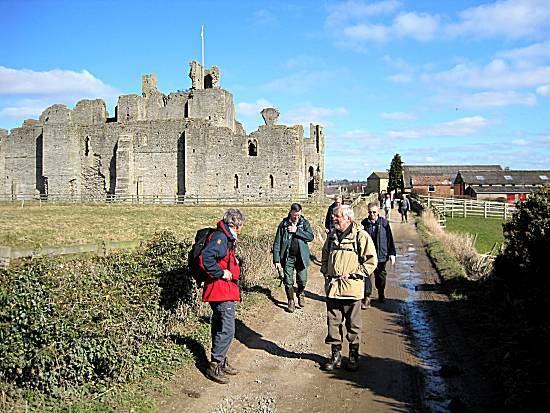 The route took the walkers through Middleham where they admired the historic castle, which was said to have been built in Neil's honour. 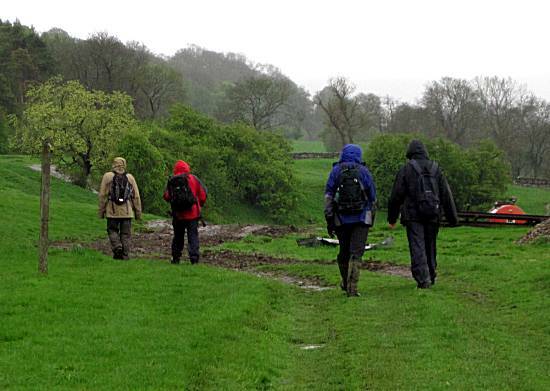 The conditions became difficult for the walkers as they left Middleham, but they remained confident of success. 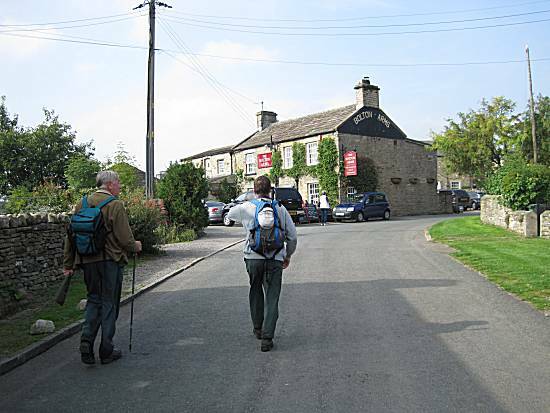 The walkers continued their route through East Witton, following the footpath back towards the river, where they stopped to leave more of Neil in sight of the Coverbridge Inn. 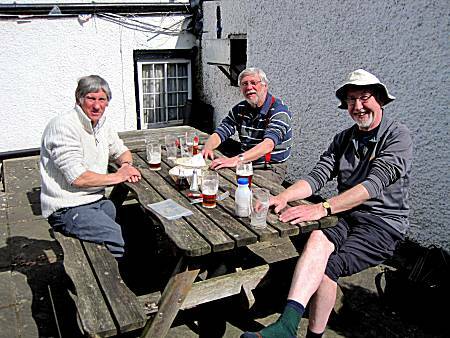 The walkers consumed much ale and excellent chips at the Coverbridge Inn where they characteristically spilt into "Insiders" and "Outsiders"
Neil stayed with the "Outsiders" and can be seen on the table in the bright sunshine. 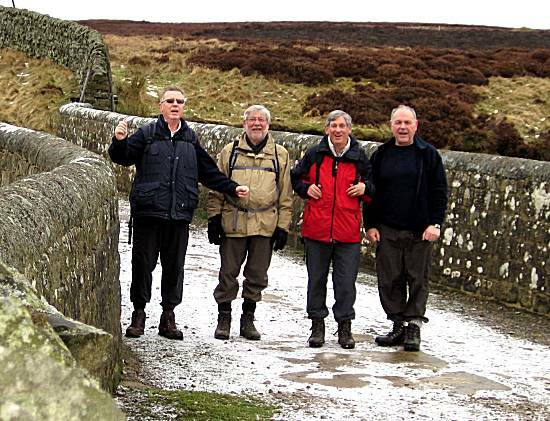 The walkers agreed amongst themselves to keep the remainder of Neil's ashes to accompany them on future walks. 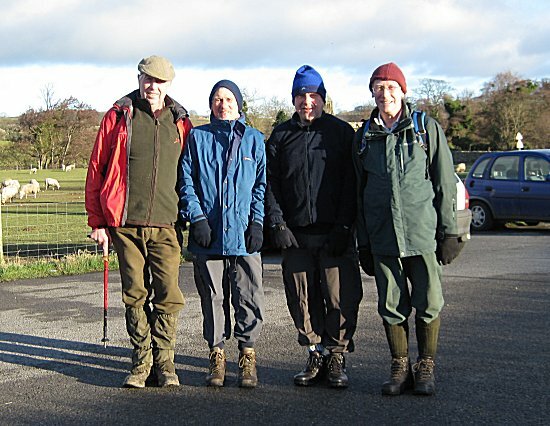 The Thoralby contingent left to walk back to Middleham whilst the others left for their homes after what they agreed to be an excellent walk in honour of our friend Neil Robertson. 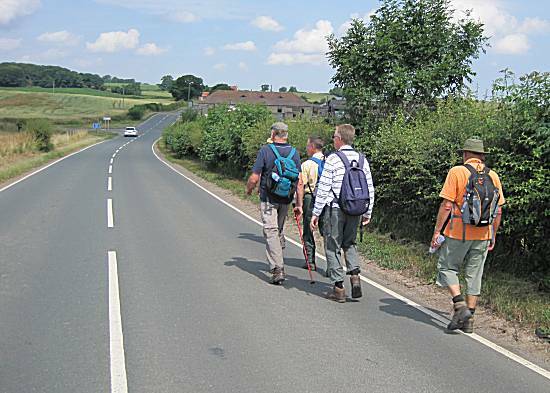 Five walkers arrived adjacent to the Navigation Inn in Ripon, but were dismayed to find insufficient suitable parking places. 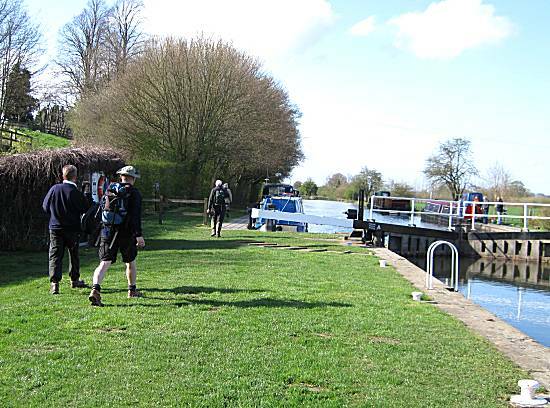 Therefore after finishing Ron's sausage & bacon sandwiches they relocated to a more suitable start location close to Lock No 1 where adequate parking spaces existed. 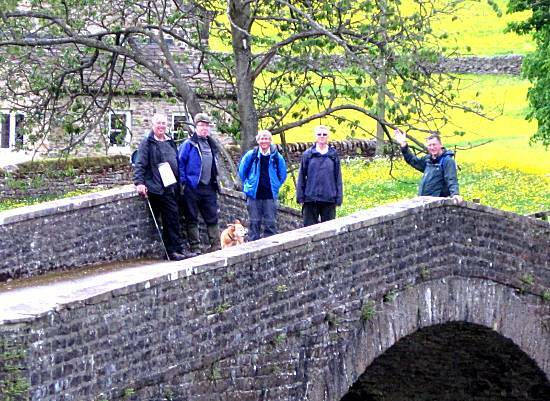 They set off following the canal back into Ripon and then taking the pathway alongside the River Skell towards Markenfield in the occasional light rain. 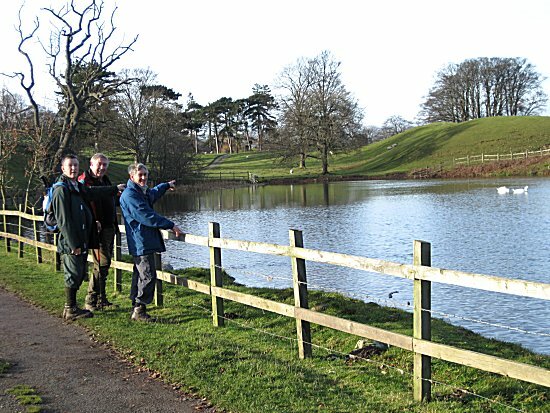 The walkers were quick to locate the magnificent moated Markenfield Hall having carefully negotiated a route passed a gigantic and vicious bull nearby. 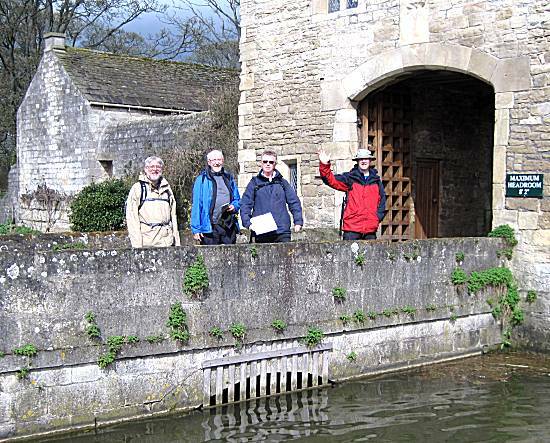 On entering Burton Leonard, the walkers could not resist gathering for a group photo on a dangerous bridge and again at a special building covering the village water pump. 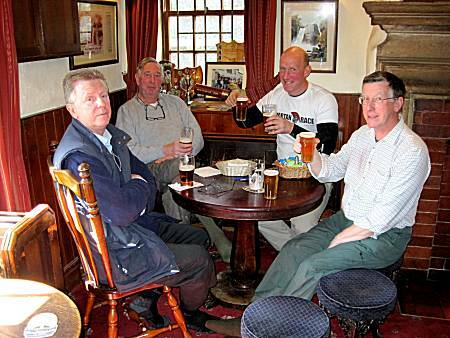 The walkers had to move indoors after it started to rain during their visit to the Hare & Hounds. Timothy Taylors ales along with some Black Sheep were consumed on their visit, but responsibly no chips were ordered. 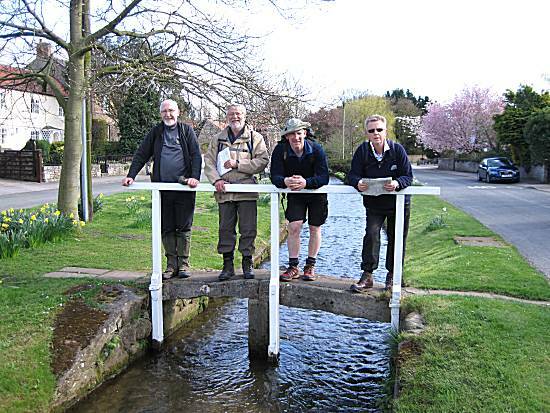 Despite the Masons Arms remaining open, the walkers continued through the village of Bishop Monkton, pausing only for a photo on a very lightweight bridge. 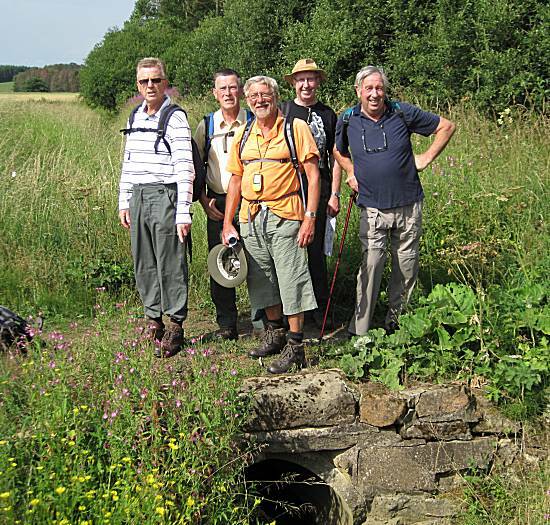 Cunningly the walkers located a shortcut to the Ripon Canal, where many of them felt the comforted by the familiar surroundings. 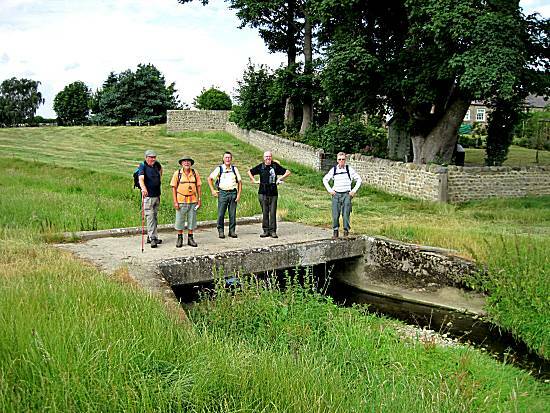 The walkers paused briefly as they crossed the canal stopping to watch the last race at the nearby Ripon Racecourse. 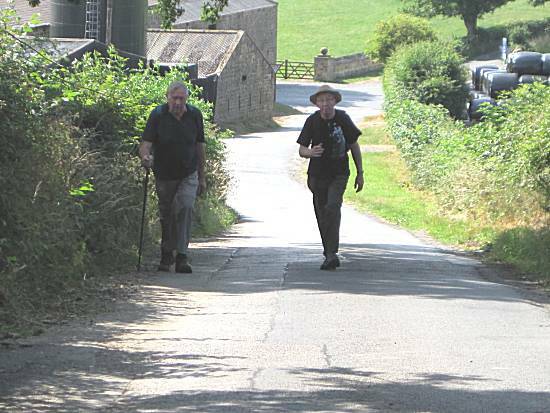 The walkers were pleased to arrive back at their cars in the warm afternoon conditions. 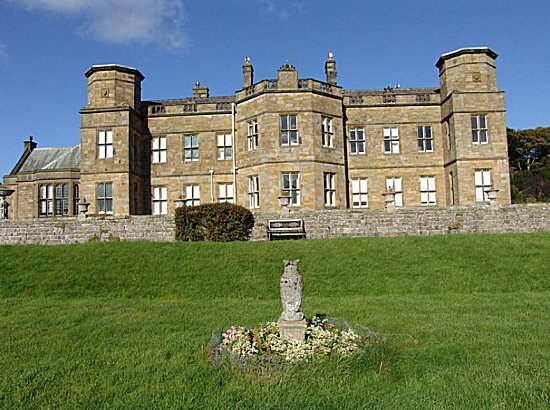 All agreed that it was an excellent and enjoyable walk, albeit somewhat longer than anticipated. Weather: Showers and breezy during the morning, but getting brighter and warmer in the afternoon. 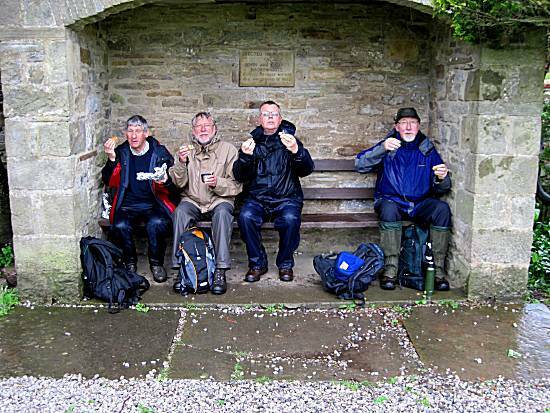 Five walkers, plus Neil in his milk bottle, arrived at the layby near Swinithwaite Hall, where they enjoyed Andy's excellent bacon and sausage sandwiches in the pouring rain. 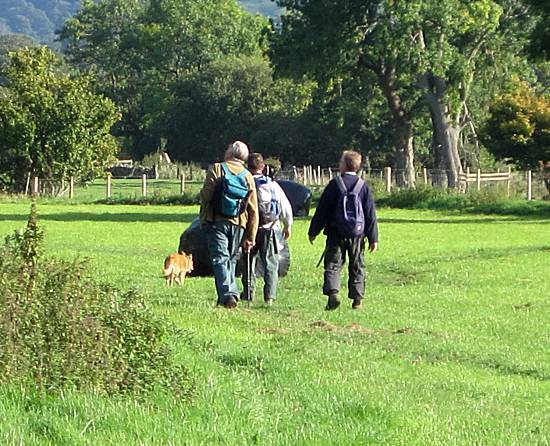 After putting on their weatherproofs they set off into Swinithwaite turning to pass the farm shop/restaurant and heading down the roadway to towards the river. 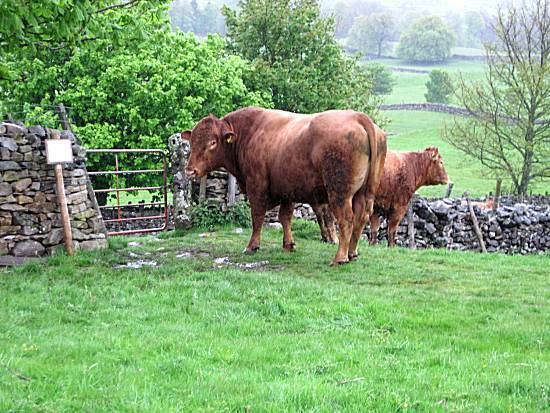 Immediately a DISASTER OCCURRED when the walkers realised that the locals had planted a giant ferocious bull to guard the gate exiting the field. 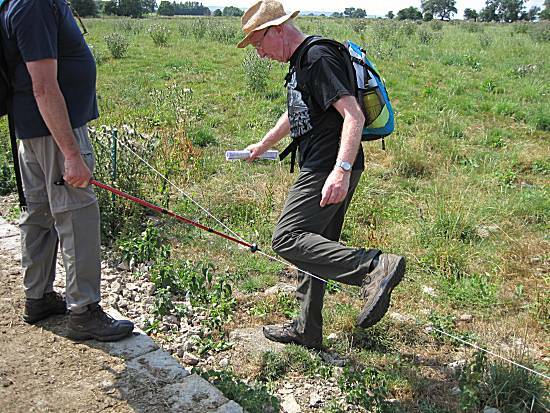 Although the brave walkers were not frightened, they chose to retrace their footsteps and find an alternative route through another field, thus thwarting the locals and saving their walk. 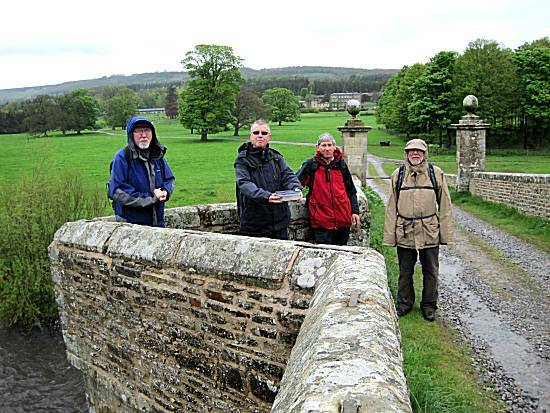 Soon the walkers found themselves following the fast flowing River Ure where after a while they admired the views of West Burton with Thoralby in the distance. They soon chose to shelter from the heavy rain and took the opportunity to take on board some Mars Bar Crispies (except Andy), greatly increasing their strength. 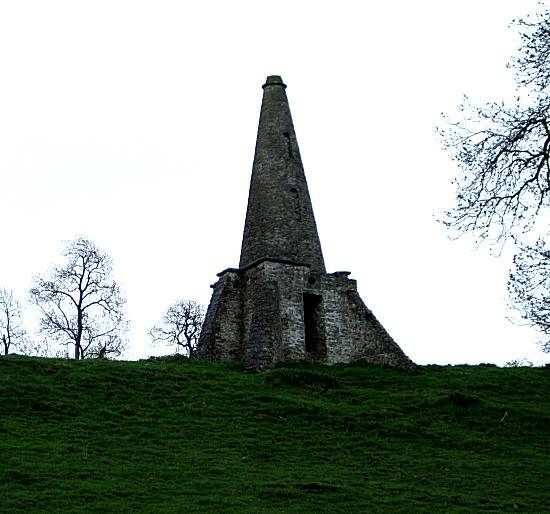 The walkers were quick to discover an amazing stone rocket being built by the locals. However, as they did not consider it a threat to the walk continued on their way. 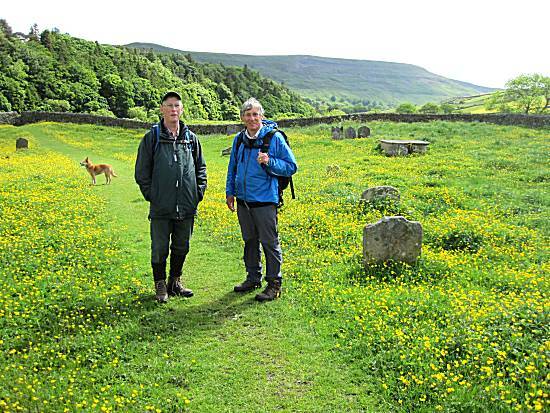 Cunningly the walkers chose not to ascend Penn Hill in the heavy rain, but elected to take the roadway down to West Witton, where they quickly located a suitable shelter to consume their Pork Pie rations (Two Varieties), whilst admiring views of the Wensleydale Heifer. 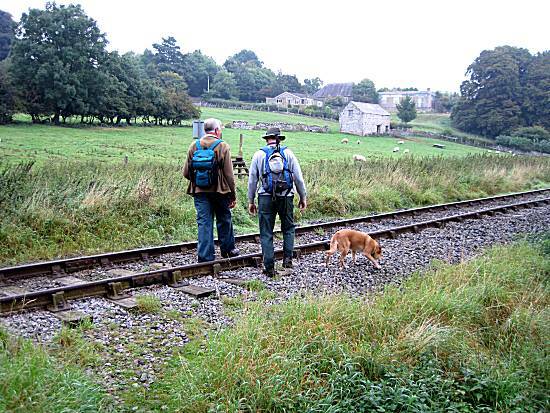 Leaving West Burton, the walkers took the direct route across the fields, where they were seen finishing the last of the Mars Bar Crispies, before continuing past Burton Hall towards their lunchtime stop at "The Three Horseshoes" in Wensley. 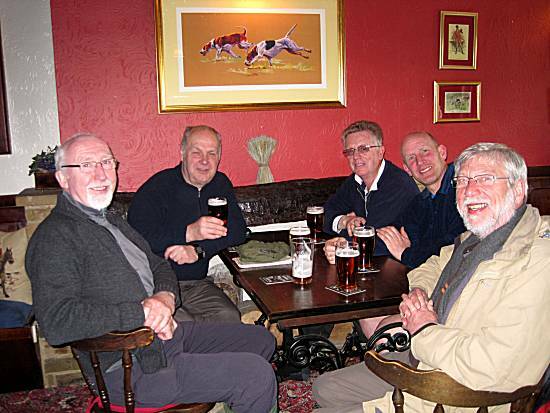 The walkers quickly settled in at The Three Horseshoes whilst they watched the Morris Dancers performing outside. 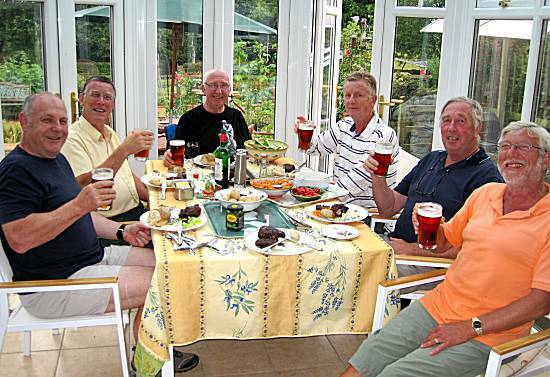 Cliff and Paul joined the walkers and together they enjoyed excellent individual portions of chips. 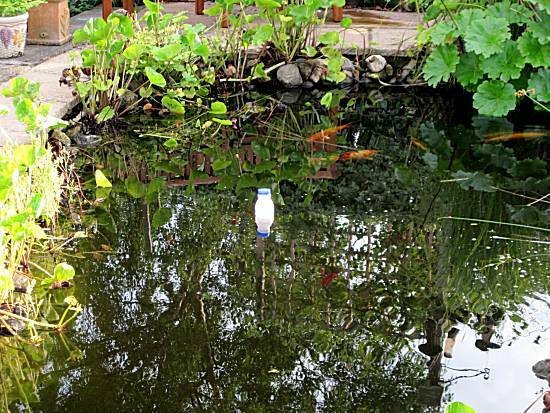 Neil enjoyed the walkers company and can be seen in his milk bottle. The rain stopped whilst the walkers enjoyed their lunchtime stop and left in high spirits. They quickly gather for a group photo on the nearest bridge. 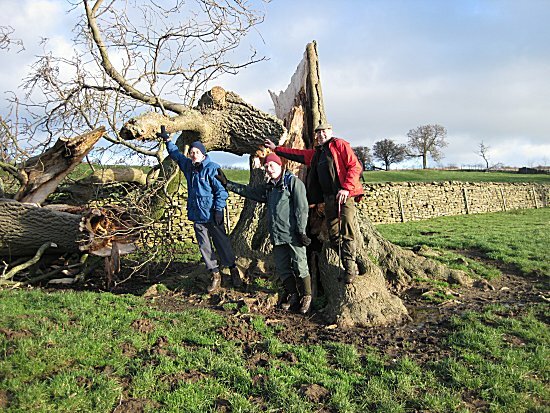 As the walkers neared completion of the walk they again admired the giant ferocious bull in the field near Swinithwaite. Arriving back at the cars, all agreed it was an excellent walk despite the rain and agreed to meet again on the 15th June. 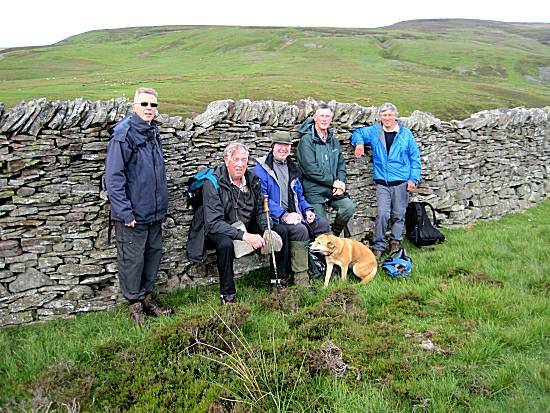 Six eager walkers, plus Ella the dog, met in the Reeth Car Park to enjoy Cliff's delicious Bacon and Sausage butties. They set off on a northerly uphill route soon to make a left turn onto moorland passing Black Hill and Riddings Rigg, heading north of Healaugh. 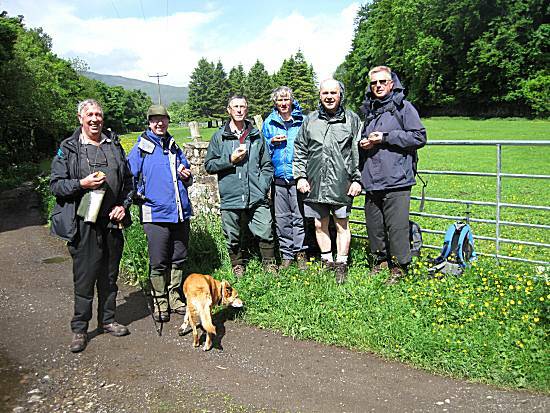 Arrival at Fore Gill Gate, signalled to the walkers that it was time to consume their valuable supplies of Pork Pie, still in the rain, despite the sunshine. 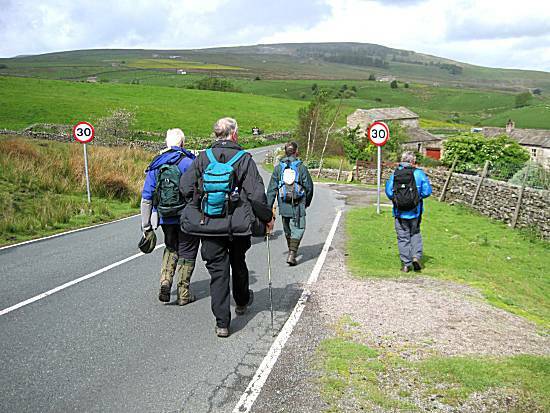 Sections of road took the walkers towards Arkle Town, where they knew that a lunchtime pub was not far ahead of them. 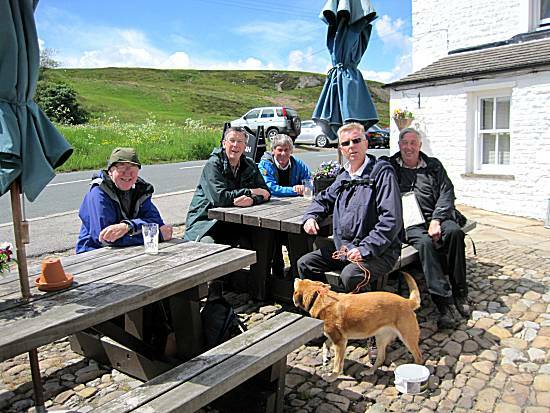 After a short stop at the Red Lion in Langthwaite the walkers continued to the CB Inn at Arkengarthdale, where they sat outside to enjoy further ale, together with small portions of chips. 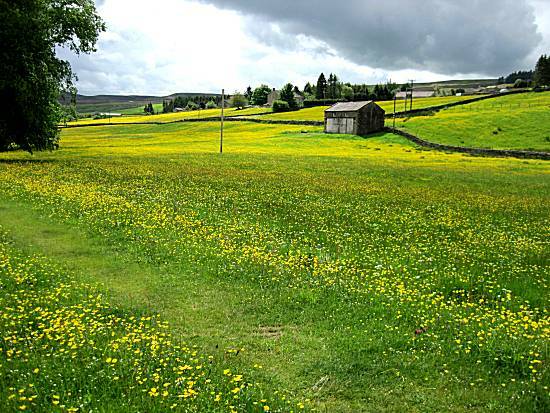 More fields of buttercups had to be negotiated on their return journey to Reeth, but the walkers remained confident of success. 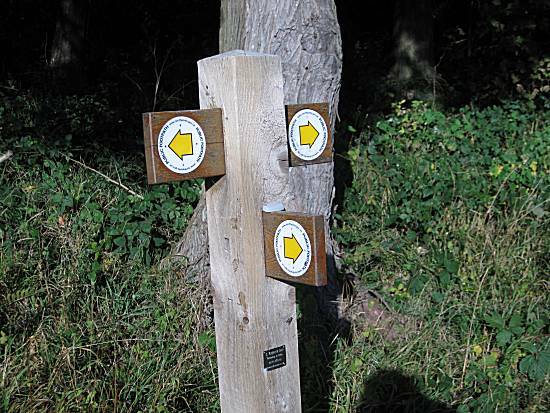 The walkers were greatly comforted on seeing the sign indicating that their walk was almost complete. Distance: 12Mls - In one morning!! 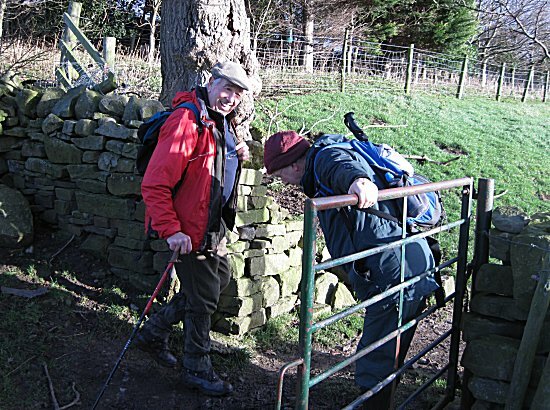 After leaving Finghall the route became unfamiliar and treacherous with the walkers becoming restless. 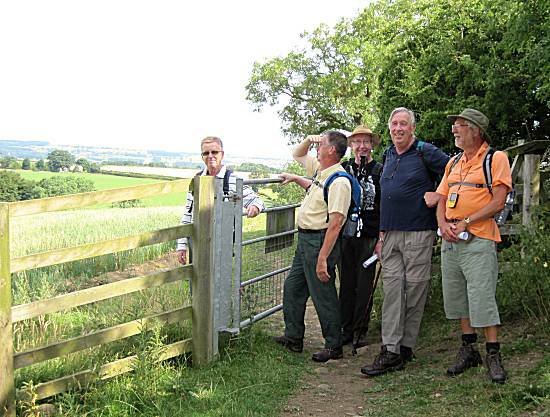 However, they all knew that Tom must have a cunning plan in place, but Alan pacified the walkers with Mars Bar Crispies. 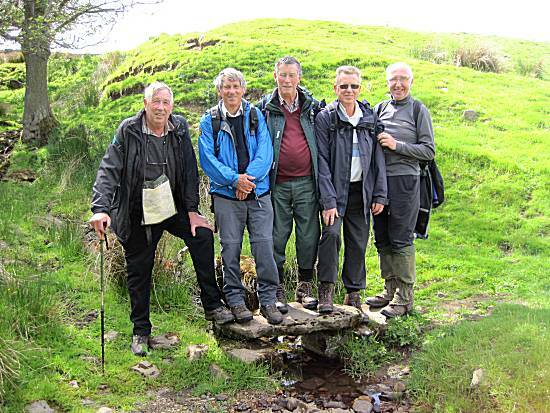 With Tom's spectacles repaired the group rapidly located a bridge on which to pose for a group photo. 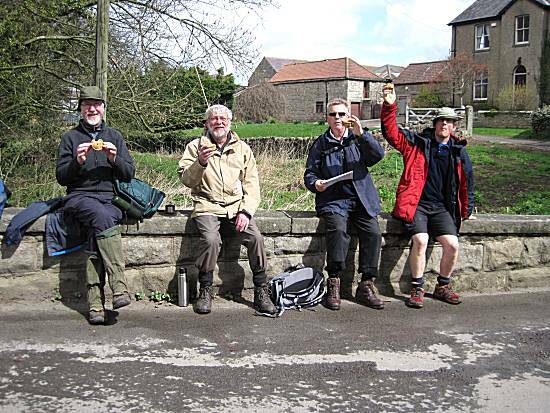 However, the walkers soon realised that completion of the walk would have to be managed without the benefit of Pork Pie. Although disappointed their spirits were lifted by Tom's kind offer of a hearty Barbeque and Black Sheep ales at the end. As the path became indistinct, Cliff took control of the deteriorating situation, leading the walkers onto a road section where they quickly regained their confidence in the hot and humid conditions. A further DISASTER OCCURRED when trying to exit a field the walkers found themselves blocked by high voltage electric fences. 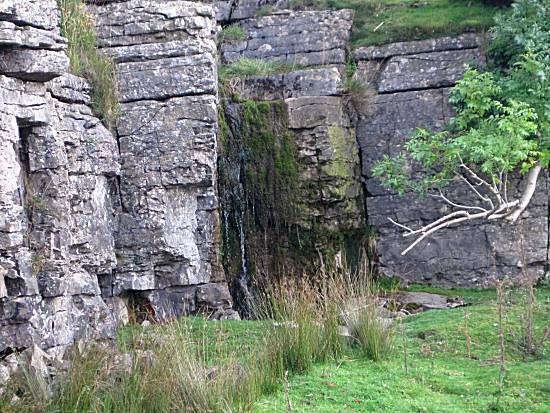 Cliff however, using his incredible insulation properties, bravely held the fence down, enabling all the walkers to escape certain death. 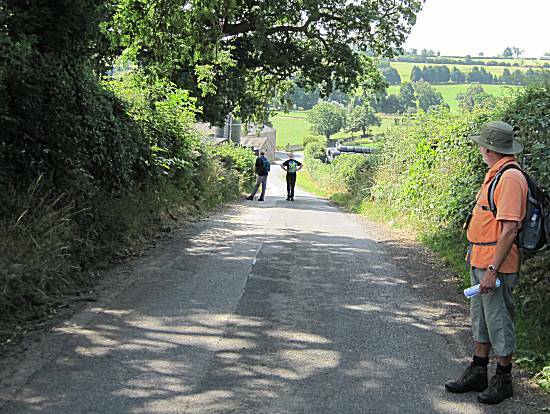 Some of the walkers spirits were lifted by Tom's continual statements that completion of the walk at Tom's residence was "Just over the brow of the Hill". However, the others secretly knew though that several hot and difficult giant fields of Barley still had the negotiated. 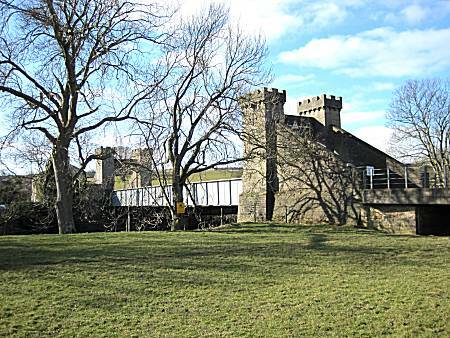 A final bridge indicated to the walkers the near completion of the mission, with Tom's Lowden Hall Estate seen in the background. 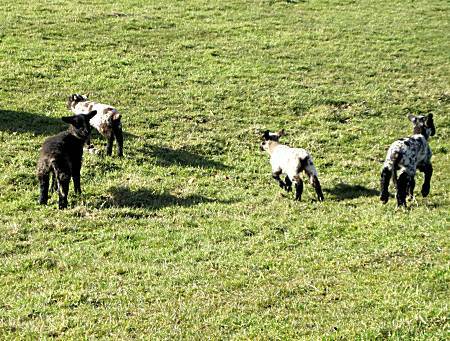 The walkers knew that a barrel of Black Sheep Ale and Barbeque'd food awaited them. There was much joviality amongst the group. Relaxing afterwards, Neil could not resist a swim with the Koi Carp, much to the distress of the others, but no disaster occurred. 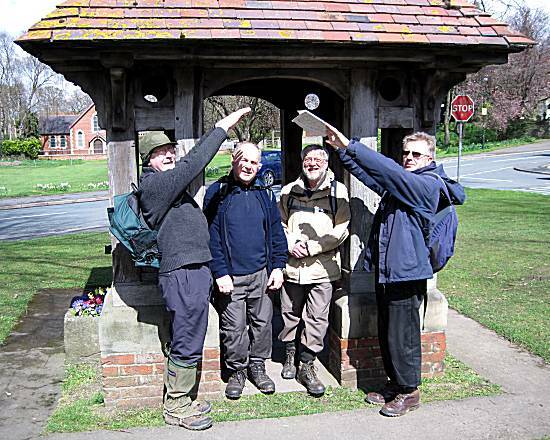 Later the wives (except Alan's) joined the walkers to congratulate them on yet another successful mission. After much merriment, they left at a late hour, having just failed to empty the barrel, but gallantly Tom agreed to do this the following day. 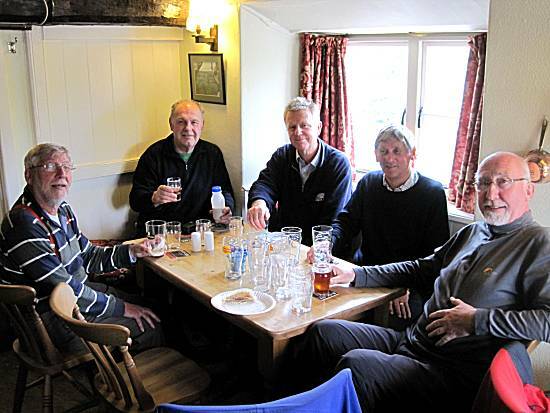 The walkers were chauffeured home after what was unanimously agreed to be an excellent day's walking, eating and drinking. 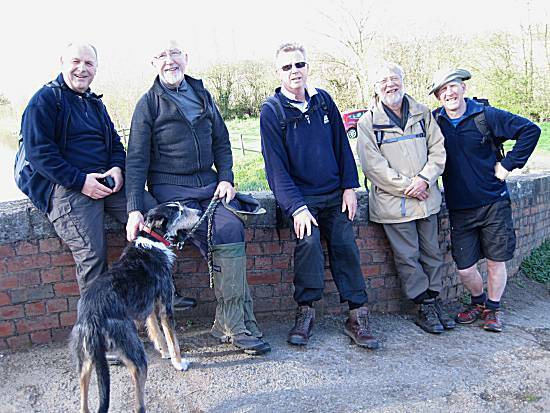 Just four eager walkers, plus Ella the dog and Neil in his Milk Bottle, met adjacent to the river bridge at Wensley, rapidly consuming Ron's bacon and sausage butties, before heading off in an unusual direction, away from the lunchtime destination. 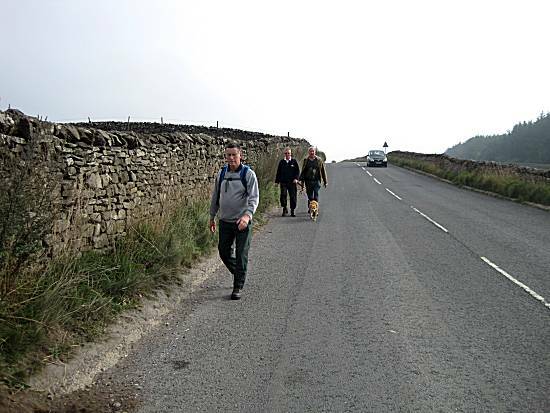 The walkers, although concerned, obediently followed Cliff, their leader for the day. 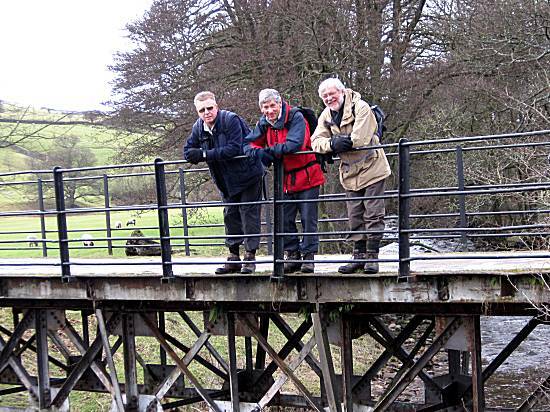 The walkers remain unconcerned even when Cliff casually led them across a live railway line!! 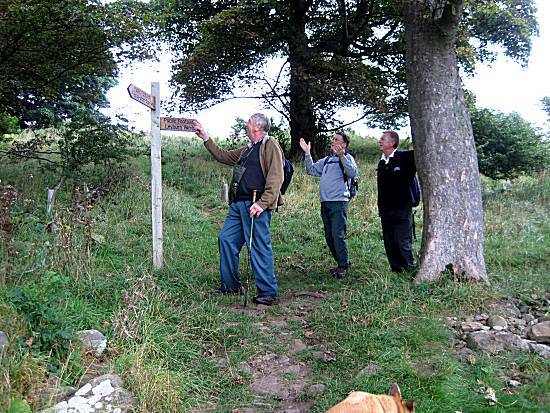 The walkers discovered that Cliff was cunningly taking them towards the "Shawl" walk, without the need to pass through Leyburn Town centre. The walkers were impressed, that their leader was so clever. 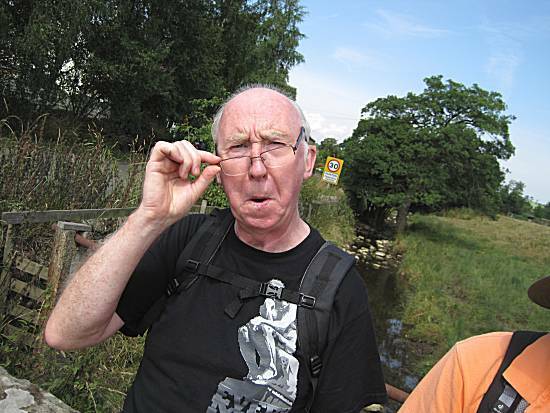 The walkers were less impressed when Cliff looked puzzled whilst studying the complex and confusing signposting. 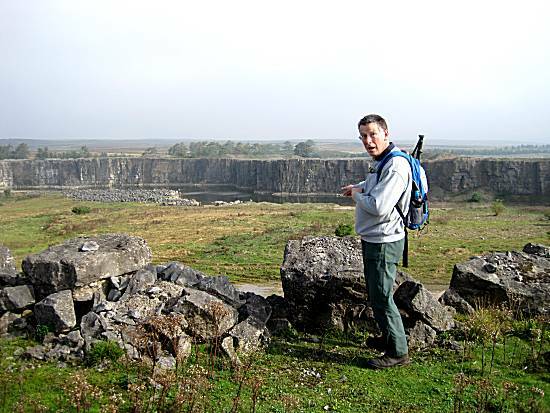 As the route took the walkers north into unknown and desolate areas, Cliff realised that, with luck, they may be able to locate a long lost giant waterfall, that the locals had talked about for many years. The walkers were excited by the prospect!! 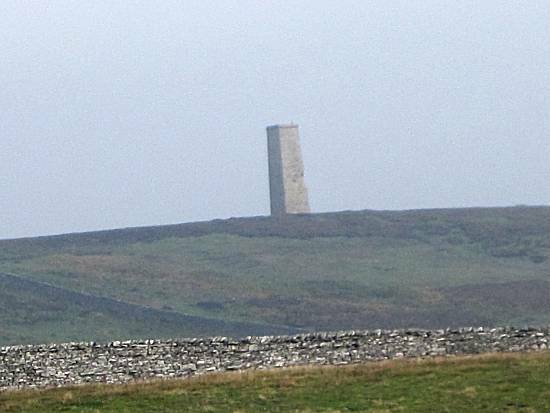 Sight of the infamous leaning chimney indicated to the cunning walkers that they were on the right route. However, they knew that they would have to pass a dangerous quarry. They continued without showing any visible fear. 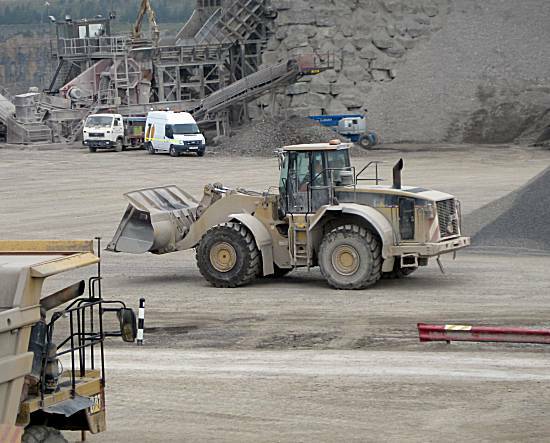 See a quarryman in great danger, Paul was quick to take control of the giant digger and rapidly finished digging out the entire quarry in record time. Paul was pleased with his performance. 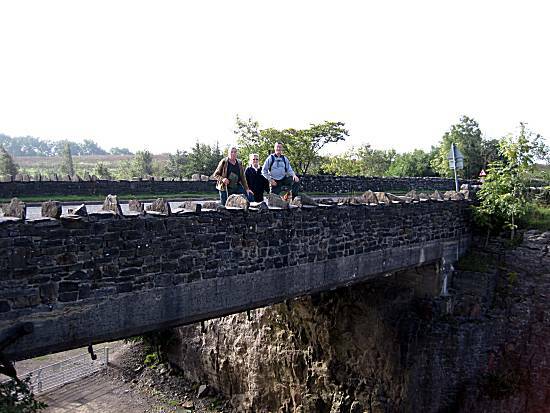 After the successes of the quarry, the walkers continued over Army training grounds and were privileged to be shown the specially constructed bridge allowing tanks to be secretly taken beneath the road. The walkers were again impressed. 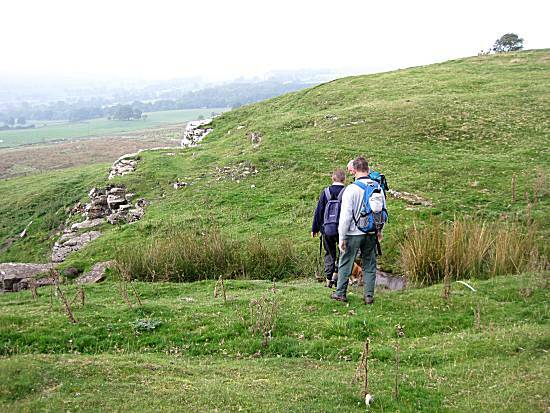 The walkers quickly located a hill and rapidly climbed to the top so that they might be able to catch a glimpse of the giant lost waterfall, but in the mist were only able to see Bolton Castle. Ella waited patiently, as she knew exactly where the giant waterfall was located, but was committed to secrecy. Against all odds, the walkers successfully located giant fast flowing waterfall and spent some minutes marvelling the wonder. 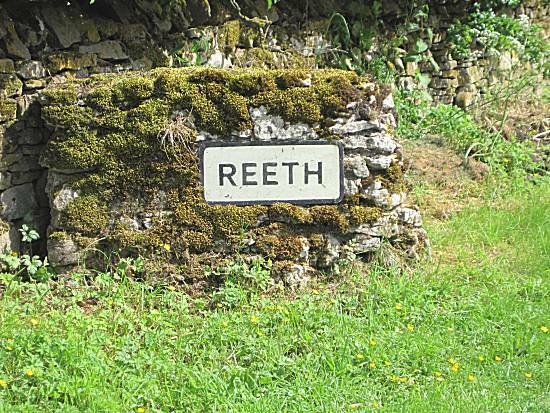 However, they set off quickly, knowing that they would have to hurry to the Bolton Arms in Redmire to report their find to the locals. 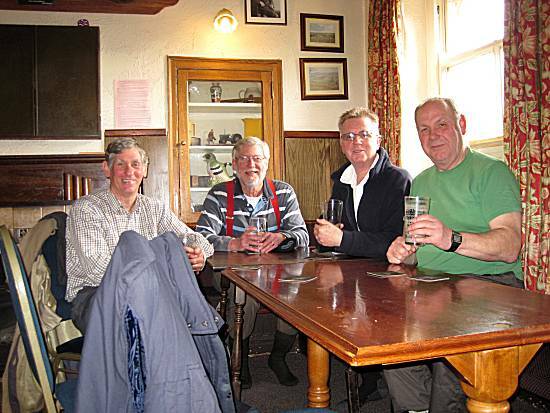 The walkers rushed to arrive at the Bolton Arms anxious to impart their news to the grateful locals. 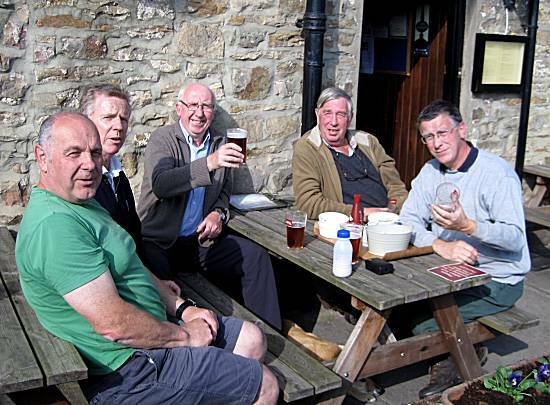 The walkers, plus Neil in his Milk Bottle, were seen enjoying Thwaites Ales and nourishing clips in the sunshine outside the Bolton Arms. 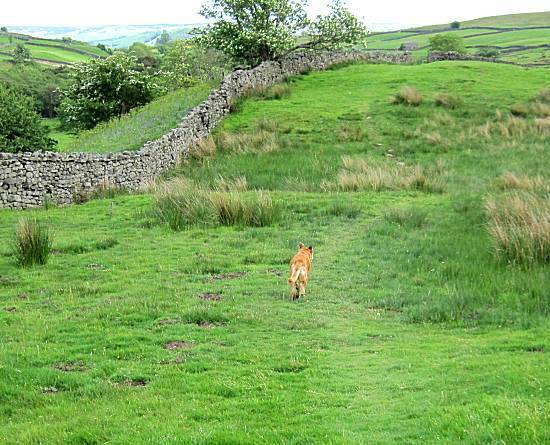 Tom, having heard the great news, hurried to congratulate the walkers on their incredible find. 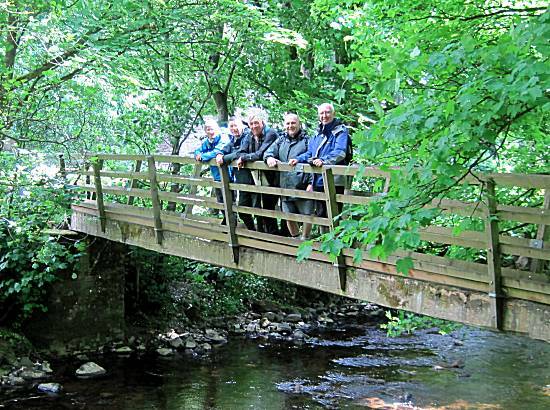 The walkers were pleased to celebrate the successes of the day, by locating a bridge and posing for a group photo. The walkers arrived back at their cars in good spirit, looking forward to their next walk. 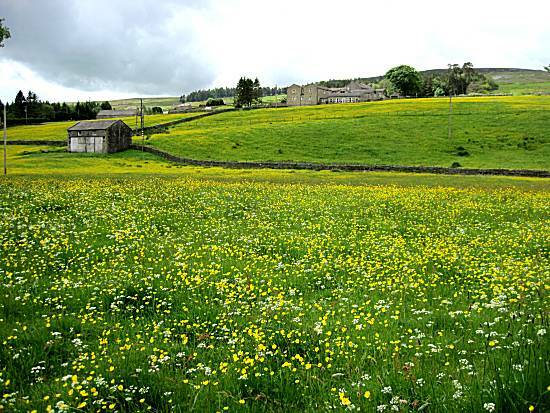 Weather: Misty in the morning with a lot of dew in the grass, but turned into a fine afternoon. 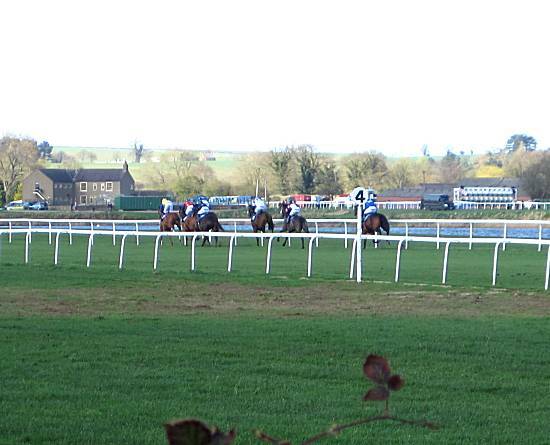 Distance: 7½Mls - In one morning!! 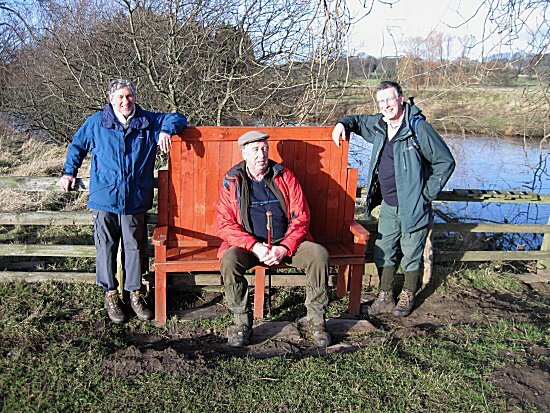 Due to the recent appalling weather, the walkers cunningly postponed their Christmas walk until Sunday when a fine sunny day was forecast. 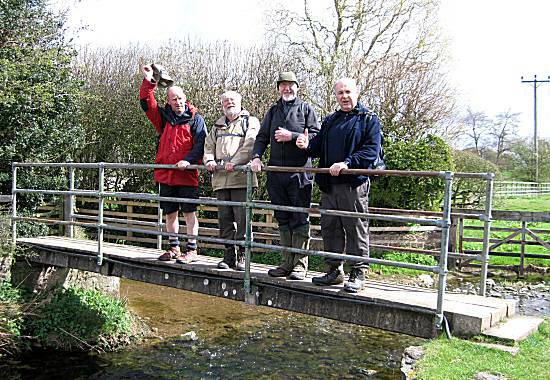 A shorter than normal walk was agreed and just 4 walkers, plus Neil in his milk bottle, met at the Coverbridge Inn car park at an early 10:30am, where bravely they set off without the benefit of Bacon Butties. Barely 30 seconds elapsed before comment was raised about Colin's unkempt appearance, been seen to have not shaved for some 2 weeks!! 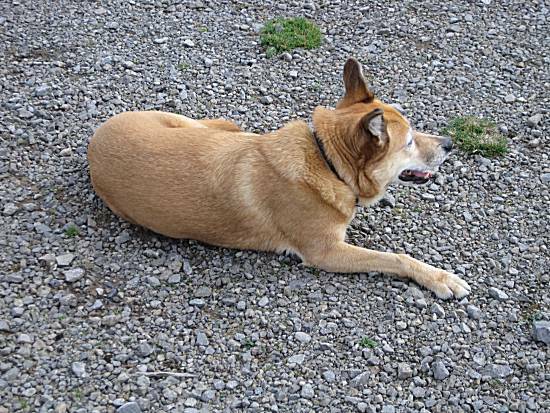 However they eventually accepted his dubious story, but made note of his promise to appear properly turned out for the next walk. 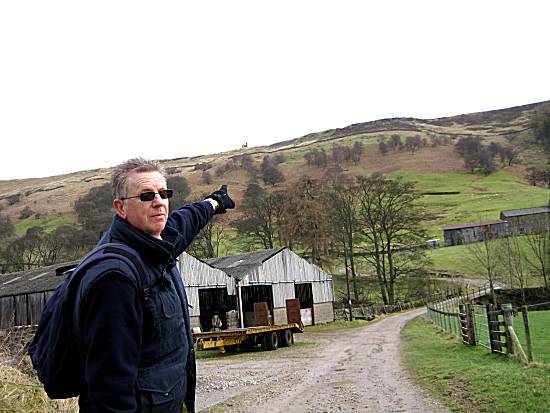 Rumours had been spoken off, regarding a giant Tornado that had had ripped a path of devastation through Coverdale earlier in the month and the walkers were keen to investigate. 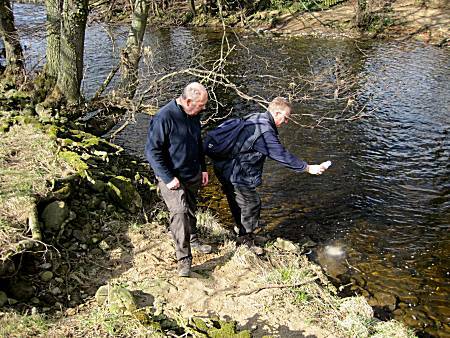 They therefore set off crossing the River Cover and then the River Ure to take the treacherous pathway towards Danby Hall. The walk continued with great reverence and the other walkers quickly learnt their position in the presence of his Lordship!! The cunning walkers quickly located numerous amounts of tree damage and were able to accuracy plot the path of the tornado and pass this on to the Authorities. Lord Cliff also pointed out a barn where the roof had been destroyed by the devastating tornado. 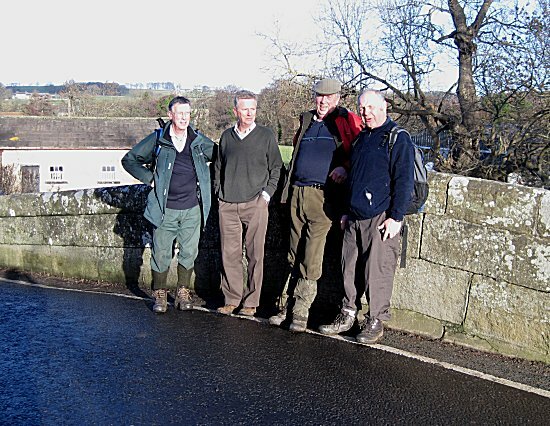 Passing through the village of Thornton Steward the walkers took a route down to a bridge over the River Ure where a customary stop was made for a group photo. The walkers rapidly took a route into the Jervaulx Abbey grounds, where they were quick to admire the new swans brought in especially by the authorities in honour of the new Lord Bailey of Thoralby. The walkers were suitably humbled!! 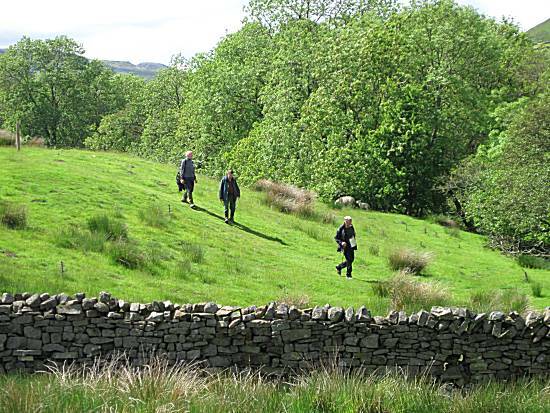 The walkers on leaving the grounds of Jervaulx Abbey took a familiar path leading back to the river. As their minds quickly focused onto the anticipated Pork Pie with nourishing chips, in the Coverbridge Inn, their pace quickened accordingly. 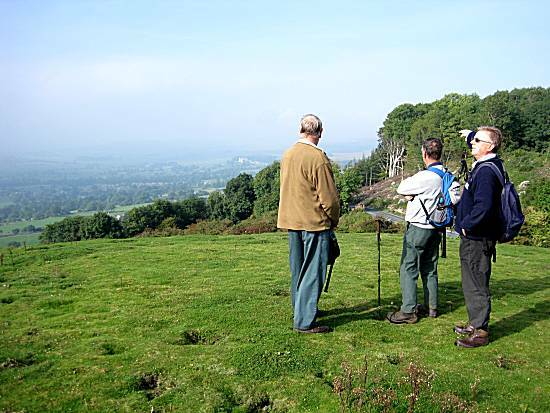 Telegraphic communication was established with Ron, who was waiting to join the walkers for lunch and to congratulate Lord Cliff in person. 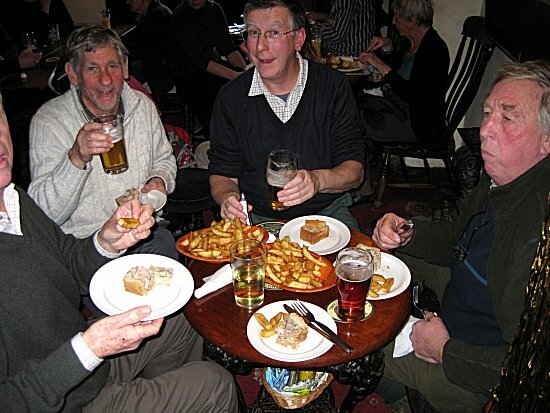 The walkers celebrate and honour the new Lord Bailey of Thoralby in style with copious quantities of nourishing chips with special home made pork pie made by his Lordship.